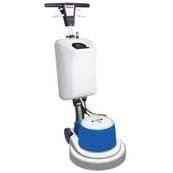 Rotary floor polishers can polish, buff & scrub your floors producing superior cleaning results. Time and labour efficiencies will save money when budgets are constantly squeezed. The used polishers we have available are continually changing so please check our website regularly to view the latest products. The Jolly 17 high speed polishing machine gives the flexibility to either polish or scrub your floors.